Sir George Ivan “Van” Morrison, was born in Belfast on August 31, 1945. He is a singer, songwriter and musician. He has received six Grammy Awards, the 1994 Brit Award for Outstanding Contribution to Music, and has been inducted into both the Rock and Roll Hall of Fame and the Songwriters Hall of Fame. In 1996 he was given the Order of the British Empire for his service to music enriching the lives of people in the UK (and beyond). Since 1996 his formal title has been Sir “Van” Morrison, OBE. In 2016 he was knighted for his musical achievements and his services to tourism and charitable causes in Northern Ireland. He is known as “Van the Man” to his fans. Morrison started his professional career when he variously played guitar, harmonica, keyboards and saxophone for a number of Irish bands while he was still in his teens. In 1964 Morrison formed the R&B garage band, Them, in Belfast, who played at The Maritime nightclub. They had hits with the garage band classics “Gloria” and “Here Comes The Night”. His solo career began with the release of the hit single “Brown Eyed Girl” in 1967. The song peaked at #10 in the USA, but climbed to #1 in Vancouver. It was the title track from Morrison’s debut album. Morrison’s music mostly draws on the conventions of soul music and rhythm and blues. Examples of this are showcased in his hit singles “Brown Eyed Girl”, “Domino” and “Wild Night”. Morrison’s father, George, was an electrician. His mother, Violet, had been a singer and tap dancer in her youth. Van was an only child and grew up in Belfast. 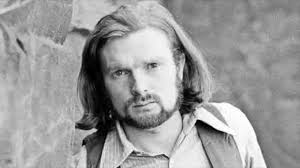 His father’s record collection of American blues and country music artists led to Van Morrison learning the guitar when he was eleven. In 1968, Morrison released a concept album titled Astral Weeks. While some music critics applauded his efforts, the album sold poorly. In January 1970, Van Morrison released his third studio album titled Moondance. 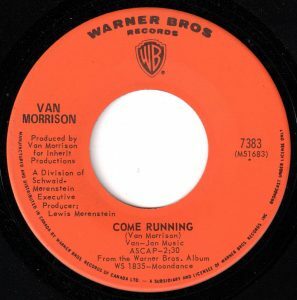 It included “Come Running”, which climbed to #38 on the Billboard Hot 100. “Come Running” offers up a song of people having free time and being playful. In a 2014 article, NPR reported that the need to take time to play doesn’t end with childhood. As adults we need to play too. So going for a walk, walking with a dog and going to the train tracks to see a train pass by help us connect with our world. The act of running toward someone else for an embrace suggests a playful space, an important way of connecting. This isn’t an activity the couple are engaging in out of duty or obligation. It is spontaneous. And spontaneity is often related to joy, cultivating a deep contentment with ones own life. “Come Running” climbed to #3 in Kansas City, #4 in Tulsa, #5 in Vancouver and St. Louis, #6 in Portland (OR) and St. Petersberg (FL), #8 in Toronto and Medicine Hat (AB), and #9 in San Francisco, Tucson (AZ) and New Haven (CT). Of course, the running that the sweetheart is doing in Van Morrison’s song, “Come Running”, isn’t about training for a race. Nonetheless, the song was a hit in the midst of a cultural transition from viewing anyone running with alarm or suspicion, to regarding it as an unremarkable occurrence. Tupelo Honey is the fifth studio album by Van Morrison and released in October 1971. The title track from the album also became a hit on the pop charts in Vancouver. At this time of writing, Van Morrison has 24 upcoming concerts between June 1 and September 15, 2018, scheduled across Pennsylvania, Massachusetts, New York, New Jersey, California, Switzerland, Germany, Norway, Sweden, Belgium, Wales, England, Isle of Wight, Denmark and Spain. Over the course of his career, Morrison has released 39 studio albums, 6 live albums and 71 singles. He has been quite prolific of late, releasing five albums in the past three years. His most recent album, You’re Driving Me Crazy, was released in April 2018. It includes tunes from the Great American Songbook and a number of his own compositions. Van Morrison biography, Van Morrison.com. Hinton, Brian. Celtic Crossroads: The Art of Van Morrison. Sanctuary Publishing, London, 1997. Mills, Peter. Hymns to the Silence: Inside the Words and Music of Van Morrison. Continuum, London, 2010. Play Doesn’t End With Childhood: Why Adults Need Recess Too, NPR, Washington D.C., 2014. Phil Edwards, When Running for Exercise was for Weirdos, Vox.com, August 9, 2015.